ELLICOTT CITY – Evelyn and Scott Henderson are able to relate a little too well to the people, many experiencing homelessness, that they have met through their ministry work in Baltimore City. 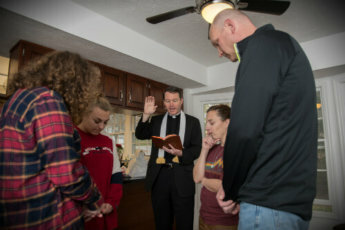 The Hendersons, parishioners of Our Lady of Perpetual Help (OLPH) in Ellicott City, were in the process of helping two of the men they have befriended into a permanent home Dec. 9, when a fire in their Howard County home left displaced their own family. 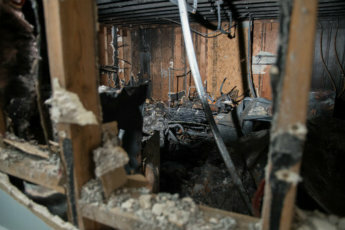 The couple, along with the youngest of their two daughters, Quinn, and their rescue dog, Scooby, awoke to a smoke-filled home around 3 a.m. that Saturday morning. The fire, which began in the garage, left the Hendersons without a home and an office for their company, Henderson Creative, for 8-10 months while repairs are made. 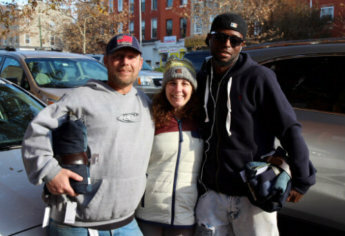 The blaze also consumed more than 200 coats and other donations which hours later were to be distributed to those in need during the Hendersons’ weekly visit to downtown Baltimore through OLPH’s Salt ministry. “There’s so much good in that garage, and it’s gone now,” Evelyn said as she watched her garage burn and her house fill with smoke. Volunteers in OLPH’s two-year-old Salt ministry prepare and share a hot breakfast on weekends at two locations in Baltimore, on the Fallsway and at Broadway and Lombard streets. Since May, the Hendersons have served at the latter site, where many of the recipients are chronically homeless due to opioid use, including those who are attempting to get clean. 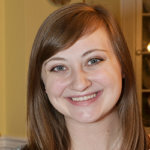 She credits conversing as one of the most important parts of their work downtown. Learning the stories of those being served encourages people to give more. That approach led the Hendersons to initiate drives for needed goods. A few months ago, they collected bed linens and socks; in December, winter coats. Their home was the collection site for 250 coats that were distributed before the fire, which destroyed a second batch of donations. “As a pastor, it’s what you hope your parishioners will be drawn into,” said Father Erik Arnold, pastor of OLPH. He said that the Hendersons have always been active in outreach, but that their work downtown is a particularly strong expression of that witness. It led the Hendersons to form a relationship with Ricky and Corey, best friends who are breaking the cycle of addiction. Slated to start a therapeutic work program at Johns Hopkins Bayview, they found out they were to lose their housing just a week before the Henderson’s lost theirs. Following the advice that they often give their daughters, “You can’t expect success without support,” Evelyn and Scott jumped into action, fearing that Ricky and Corey might not be able to continue in the Hopkins work program. “It’s really hard to get clean and sober when you’re poor,” said Evelyn, who called multiple organizations to find out that there were no options for Ricky and Corey; waiting lists for housing ranged from six months to seven years. Through the help of many parishioners at OLPH, the Hendersons found temporary housing, and then a permanent room for Ricky and Corey. Evelyn and Scott helped to move them into their new home on Dec. 15 – six days after losing their own. Evelyn said that her grandmother had a collection of saints, describing them as, “the litany of saints – all plastic.” After her grandmother died, Evelyn inherited one of the small statues of the Blessed Virgin Mary, which has been placed above the kitchen sink in all of the Hendersons’ homes. Mary now sits above the sink in the Hendersons’ rental home, where they, Quinn, a junior at Centennial High; and their oldest daughter, Mevie, who was finishing her first semester at Salisbury University at the time of the fire, will celebrate Christmas. “I feel more blessed than cursed,” Scott said. The first people to show up at their home after the fire were friends from OLPH. 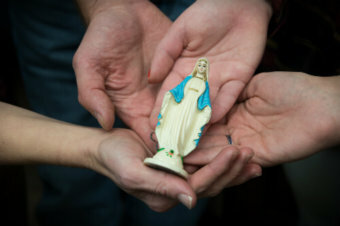 The couple said they are overwhelmed by the support from the parish through prayers, gift cards and donated clothing. Ricky and Corey, who were recipients of the ministry’s work, now serve the Salt ministry, as they plan to be among those helping OLPH distributing boxes filled with food and clothing to those in need in Baltimore City Christmas morning.